If you were looking for a professional poker player to back, you would be hard pressed to find anyone more talented than Jason Mercier. With over $15 million in live tournament cashes since 2008, including 3 WSOP bracelets and 2 EPT titles, 28 year old Mercier has a ton of room to grow those numbers, just as he did over the weekend. Jason took down the 2015 Seminole Hard Rock Poker Open High Roller event for $652,800. Mercier topped a fierce list of 83 all-American competitors who each reached deep to buy into the $25,400 high roller event in Fort Lauderdale, FL. An impressive throng of the best poker elitists turned out to compete for the $2,075,000 prize pool. The final table was brimming with talent. The first to exit was David Peters, who brought his live career total to over $6.79 million with the 9th place, $57,500 finish. WSOP bracelet winner Phil “Unabomber” Laak came in 8th for $74,400, while David “Doc” Sands, who’s racked up over $10 million in combined live and online cashes, was eliminated in 6th for $116,600. WSOP bracelet winner Barry Hutter’s day ended with a 5th place cash of $141,900. Next out was 2015 Bellagio Cup XI Champ Sean Winters, snagging $245,500 for the 3rd place finish. 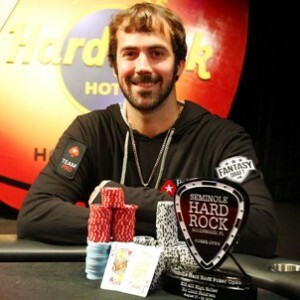 That left Jason Mercier to face off with rising poker star Ian O’Hara, a 4-year pro from Boca Raton who had collected over half a million in live tournament cashes prior to his entry into the Seminole Hard Rock Poker Open high roller. The heads-up battle between Mercier and O’Hara was a tough one, to put it mildly. On what would become the final hand of play, Ian shoved his remaining stack on a 3-bet after peaking underneath at Ax Kx. Mercier didn’t hesitate to make the call, tabling Jx Jx in the process. The final showdown played out as the dealer spread the board, Jx 2x Jx 4x 7x, giving Mercier the set, the pot and the 1st place prize of $652,800. For his remarkable efforts, Ian O’Hara’s runner-up finish was worth $391,700, bringing his live career earnings to just under $1 million ($991,148). Mecier’s latest win was just one of his many accomplishments this summer. The young American poker pro cashed four times at this year’s 2015 WSOP, scooping his third bracelet along the way. He started with a 29th place finish in Event #6, a $1k NLHE Hyper Turbo worth $6,319. Two weeks later, Mercier outlasted a field of 550 in Event #32, $5k NLHE 6-Max, collecting his 3rd WSOP bracelet and $633,357. The following week, Jason competed in the $50k Players Championship, eliminated in 7th for $139,265. Five days later, he finished runner-up to Denmark’s Alexander Peterson, pocketing $572,989 in Event #54, $10k PLO Championship.